Rapid demographic growth in Douala city, Cameroon, has resulted in profound ecological and environmental changes. Although demographic changes can affect anopheline mosquito breeding sites, there is a lack of understanding about the epidemiological impact that such changes might have on vector ecology and malaria transmission. A 12-month entomological study was conducted in a highly populated district of Douala called Ndogpassi. Adult mosquitoes were collected using two methods: 1) human landing catches (HLC); and 2) Centers for Disease Control and Prevention (CDC) light traps; these methods were used twice monthly from January to December 2011. Mosquito genus and species were identified with morphological and molecular diagnostic tools. The sampling efficiency of the CDC light trap and HLC were compared. Anopheles gambiae infection with Plasmodium falciparum was detected using ELISA. Susceptibility to DDT, permethrin, and deltamethrin insecticides were also determined. A total of 6923 mosquitoes were collected by HLC (5198) and CDC light traps (1725). There was no equivalence in the sampling efficiency between light traps and human landing catches (P > 0.01). With 51% of the total, Culex was the most common, followed by Anopheles (26.14%), Mansonia (22.7%) and Aedes (0.1%). An. gambiae ss (M form) comprised ~98% of the total anophelines collected. An. gambiae had a biting rate of 0.25 to 49.25 bites per human per night, and was the only species found to be infected with P. falciparum. A P. falciparum infection rate of 0.5% was calculated (based on enzyme-linked immunosorbent assays using the circumsporozoite surface protein). The entomological inoculation rate was estimated at 31 infective bites per annum. Insecticide susceptibility tests on An. gambiae females revealed a mortality rate of 33%, 76% and 98% for DDT, permethrin and deltamethrin, respectively. The West African kdr allele (L1014F) was detected in 38 of the 61 An. gambiae analyzed (62.3%). The present study revealed seasonal malaria transmission in Douala. High levels of An. gambiae were detected along with a high prevalence of insecticide resistance in this vector population. These findings highlight the need to promote use of insecticide-impregnated bed nets in Douala. Urban malaria is an emerging health problem in Africa . Some reports indicate that the rapid demographic growth of some urban areas presents a serious challenge for the control of endemic diseases such as malaria [1, 2]. Several factors influence the epidemiology and severity of malaria disease in urban areas; these factors include the geographical characteristics of the town, the level of immunity in the local population, the extent of unplanned urbanization, urban agriculture development, and the degree of human migration from rural to urban areas [2, 3]. Although unplanned urbanization characterized by poor housing, lack of sanitation and inadequate surface water drainage is recognized as one of the major factors maintaining the presence of Anopheles gambiae in some urban settings , it has not been extensively studied in Cameroon. In Cameroon, malaria affects over 90% of the population and is responsible for 35% of the annual mortality . Despite the regular occurrence of malaria cases in urban settings, only a limited number of studies have addressed the epidemiology of the disease in such settings. Entomological studies in the city of Yaoundé, reported low malaria transmission rates in central districts, but high transmission rates in peripheral locations [5–7]. Parasitological studies on the other hand, revealed an annual prevalence of 35% of Plasmodium falciparum asexual parasites carriers, a seasonal variation of parasites prevalence in the population and, a potential infectious reservoir dominated by the age group ranging from 0 – 15 years . The city of Douala, the largest in Cameroon, has, paradoxically, received less attention. Although there are some similarities between Douala and Yaoundé, several climatic and environmental contrasts exist. For example, Douala is a port city close to the Atlantic Ocean with year-round rainfall and a high level of spontaneous urbanization compared with Yaoundé, which is situated inland at high altitude. All this making that Yaoundé and Douala could experience distinctive malaria epidemiological conditions. Since the 1950s, successive changes have been made to the Cameroon National Policy for Malaria Control. From the 1950s to the 1960s malaria control efforts were mainly oriented on indoors residual spraying of insecticides, in the 1980s primary health care services were promoted, and in the 1990s insecticide-treated bed nets came into use. A lack of knowledge about malaria epidemiology in different contexts has undoubtedly contributed to variations in the success of such measures to combat the disease . Thus, better understanding of the factors affecting malaria epidemiology in Douala could assist efforts towards malaria control in the city. This work falls into a series of studies aimed at assessing the influence of urbanization on malaria vector bionomic and malaria transmission in the two major urban cities of Cameroon: Douala and Yaoundé. A recent study conducted in the city of Douala, revealed the presence of a number of mosquito breeding sites that persisted all year long as well as a high prevalence of mosquito resistance to DDT and permethrin insecticides . Here, we present the results of a 12-month study on the dynamics of malaria transmission and mosquito burden in the district Ndogpassi Douala, which contains hundreds of thousands of urban dwellers. The study took place in Ndogpassi (3° 48’N 10° 08’E), a district of Douala, which is the largest city in Cameroon and comprises around 2.5 million inhabitants . Douala is located within the Congo-Guinean phytogeographic zone near the Atlantic coast and lies about 1 meter above sea level. It has an equatorial climate with two rainy seasons from March to June and August to November and about 3,500 mm of rainfall annually. The district of Ndogpassi, which a decade ago was situated at the edge of the town, is now fully integrated into the city, thus extending the urban domain. Part of the area is covered by marshland that is exploited during the dry season for urban agriculture. Nearly all the district has numerous stagnant pools of water all year long. Ndogpassi is one of the most densely populated districts in the city with a population estimated to be several hundreds of thousands. Adult mosquitoes were collected from January to December 2011. Two sampling methods were used. (1) Human landing catches (HLC) took place between 19:00 to 06:00. Collections were performed outdoors at four randomly selected sites on two consecutive nights each month (two teams of volunteers collected the mosquitoes each night; one team from 19:00 to 01:00 and the other from 01:00 to 06:00). All volunteers consented to mosquito capture and were given free malaria prophylaxis. (2) Seven light traps (LT) of the Centers for Disease Control and Prevention (CDC) type were placed indoors at seven sites using distances between 50 and 500 m.
The study was conducted under ethical clearance No. 216/CNE/SE/09 from the Cameroon National Ethics Committee Ref IORG0006538-IRB00007847-FWA00016054. Mosquitoes were identified at the genus and species level. Anophelines were identified for species type using the morphological characteristics provided by the identification keys of Gillies and Coetzee  and Gillies & De Meillon . Specimens were stored individually in numbered tubes containing desiccant, after which they were archived and stored at −20°C until ready for processing in the laboratory at Yaoundé. Members of the An. gambiae complex were identified using the molecular diagnostic tools described previously . DNA extracted from a mosquito leg and/or wing was used for analysis. The heads and thoraxes from female anophelines were tested for the presence of the P. falciparum circumsporozoite protein (CSP) using enzyme-linked immunosorbent assay (ELISA) . The CSP positive rate was calculated as the ratio of P. falciparum-infected mosquitoes over the total number of mosquitoes tested by ELISA. The entomological inoculation rate was calculated by multiplying the human biting rate estimated from HLC by the CSP rate. Insecticide susceptibility tests were performed on 2- to 4-day-old unfed An. gambiae s.l. The An. gambiae larvae used for this analysis were collected from temporary and semi-permanent breeding sites situated near the study area. Batches of 20 to 25 mosquitoes per tube were exposed to insecticide-impregnated papers (Liverpool School of Tropical Medicine, UK) for 1 hour. The insecticide susceptible An. gambiae Kisumu strain was used as a control to measure the effectiveness of the impregnated papers. The following diagnostic concentrations of insecticides were tested: 4% DDT, 0.75% permethrin, and 0.05% deltamethrin. The numbers of mosquitoes knocked down by the insecticide were recorded every 5 minutes during exposure. After exposure, mosquitoes were fed with a 10% glucose solution and the number of dead mosquitoes was recorded 24 hours post-exposure. Tests using untreated papers were systematically run as controls. The mortality rates were corrected using the Abbot formula  whenever the mortality rate of the controls was between 5 and 20%. World Health Organization criteria  were used to evaluate the resistance and susceptibility status of the mosquito population tested. Three classes of insecticide susceptibility were defined: insecticide resistant (<80%), insecticide tolerant (80 to 97%), and insecticide susceptible (>97%). To screen for the presence of kdr alleles (L1014F and L1014S) that confer resistance to DDT and pyrethroid, DNA extracted from individuals exposed to insecticides was tested using the Hot Ligation Oligonucleotide Assay from Lynd et al. . Houses were selected for light trap catches where the number of occupants comprised 8 to 12 individuals; this approach reduced bias from large differences in the number of human inhabitants per site. Prior to the study, preliminary mosquito collections were conducted using the light traps. Only houses with the highest numbers of mosquitoes were selected for further investigation. To assess linear correlations between the two collection methods, the Pearson correlation coefficient was used to calculate the average number of mosquitoes collected nightly by the LT and HLC methods. Prior to analysis, the average number for each catch (x) was transformed to Y = log(x + 1). 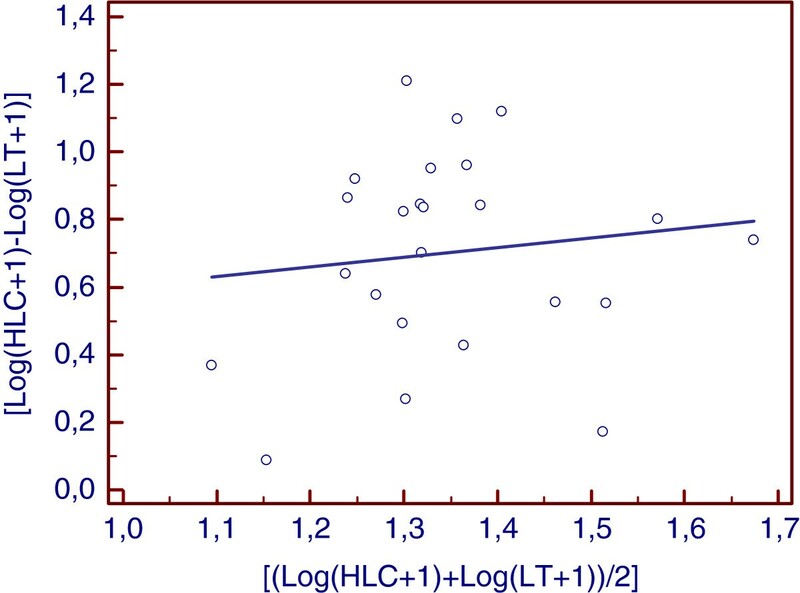 To compare methods and determine if mosquito abundance was affected by the sampling efficiency of each method used, the ratio of the number of mosquitoes in LT to the number of mosquitoes in HLC (Log(HLC + 1)-Log(LT + 1)) was plotted against the average abundance [Log(HLC + 1) + Log(LT + 1)]/2 as described by Overgaard et al. .
A total of 6923 mosquitoes belonging to four genera were collected; these comprised Anopheles, Culex, Mansonia, and Aedes. Of these 6923 mosquitoes, 5198 were collected by a total of 96 men-night catches while 1725 were collected over 168 nights using CDC LT. Culex (51% of the total) was the most prevalent species, followed by Anopheles (26.14%), Mansonia (22.7%) and Aedes (0.1%) (Table 1). The majority of the Culex species were Culex quinquefasciatus, whereas Aedes species comprised A. aegypti and A. albopictus. Two species of anophelines, namely, An. gambiae sensu stricto (1805/1810) and An. ziemanni (5/1810) were collected. For molecular identification of the An. gambiae M and S forms, an average of 20 to 40 mosquitoes were randomly selected from those collected each month using both HLC and CDC LT methods. The results of these collections showed that An. gambiae specimens mostly comprised the M molecular form (384/386); only two specimens were of the S molecular form (2/386). N : number of mosquitoes collected, B/m/n : Bites/man/night, Trap/N : number collected in a trap per night. The average number of mosquitoes collected by HLC was 54.2 mosquitoes per man per night, whereas the average number of mosquitoes collected by CDC LT was 10.3 mosquitoes per trap per night. Culex mosquitoes were most frequently collected by light traps (41.7% of the total) compared with An. gambiae and Mansonia (6.6% and 7.9% of their total numbers, respectively). The Pearson correlation coefficient, which was used to assess the relationship between nightly LT and HLC catches, indicated that there was no consistency in the sampling efficiency between LT and HLC when all mosquitoes were considered (r = −0.35, P = 0.53). When mosquitoes were separated into the three most common genera, the correlation was positive but not significant for Anopheles (r = 0.44, P = 0.03) and Culex ( r = 0.36, P = 0.09) but negative for Mansonia (r = −0.16, P = 0,46). Figure 1 shows an analysis of the ratio of LT to HLC plotted against mosquito abundance. No significant tendency for increased sampling effect with increasing mosquito abundance was detected (P = 0.53) (Figure 1). Relation between light trap catches (LT), human landing catches (HLC) and vector abundance. The mosquito burden in Ndogpassi was mainly associated with the presence of An. gambiae, Culex and Mansonia. These mosquitoes were present all year long with biting rates varying with the rainfall. An. gambiae was responsible for a biting rate of 0.25–49.3 bites per man per night. Culex mosquitoes were present all year long, and their biting rates always exceeded 10 bites per man per night. In contrast, Mansonia were more common during the long dry season in January and February (Figure 2). The following seasonal variations in An. gambiae numbers were recorded (in bites per man per night): 42.12 and 1.87 during the short (July) and long dry seasons (December to February), respectively, and 99.13 and 68.63 during the short (March–June) and long (August–November) rainy seasons, respectively. 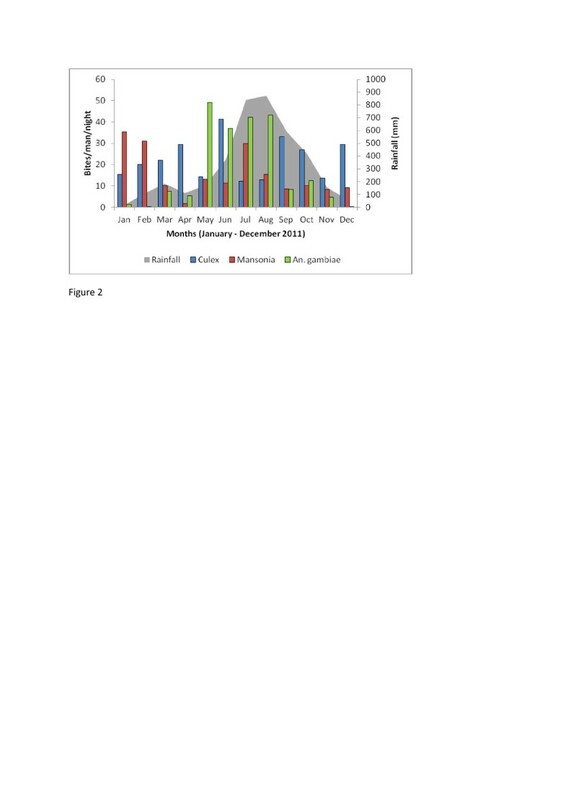 Graph showing the biting rates for culicines and Anopheles gambiae in Ndogpassi district, Douala, from January to December 2011. Figure 3 shows the cycle of night-time biting activity where it can be seen that An. gambiae densities were higher between 10 PM and 5 AM with a peak biting activity between 1 and 2 AM (Figure 3). Night biting cycle of An. gambiae in the district of Ndogpassi Douala. Nine An. gambiae from the 1765 anophelines tested by ELISA (4 An. ziemanni and 1761 An. gambiae) were found to be infected with P. falciparum. The P. falciparum infection rate, which was calculated from the number of positive CSP ELISA results, was 0.5% (95% CI: 0.2% - 0.97%). One of the infected mosquitoes was collected by CDC LT, while the rest were collected by HLC. We found that malaria transmission was seasonal and occurred from March to August, with the highest transmission recorded in May 2011 (Figure 4). The annual entomological inoculation rate was estimated at 31 infective bites. Monthly malaria transmission in Ndogpassi, Douala from January to December 2011. A total of 757 An. gambiae females were tested for their susceptibility to DDT and pyrethroid insecticides. Mortality rates of 33%, 76% and 98% were recorded for DDT, permethrin and deltamethrin, respectively. The An. 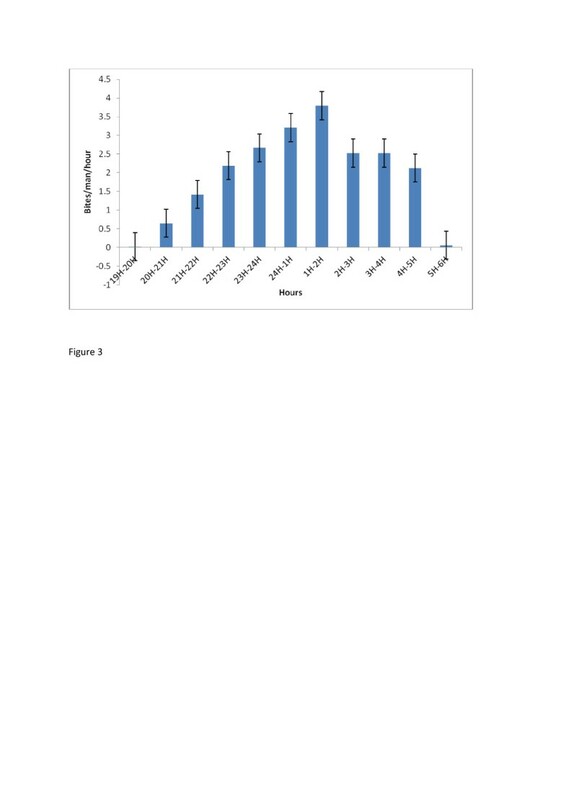 gambiae insecticide susceptible strain Kisumu, which was used as a control, had a mortality rate of 100% for permethrin (100/100) and deltamethrin (100/100), and 94% for 4% DDT (94/100). Interestingly, we noted that the mosquito knockdown times were four to 12 times higher than the corresponding values for the Kisumu strain (Table 2). kdr allele screening was conducted on 61 specimens selected from mosquitoes that survived exposure to DDT, permethrin and deltamethrin; 38 (62.3%) were found to carry the L1014F allele at this locus. In contrast, the L1014S allele, which is common in East Africa, was not detected. Twenty-seven samples were homozygous for the L1014 F allele, whereas 11 samples were heterozygous at this locus. N: number of mosquitoes tested, Kd: knockdown times, Bold: resistant populations. Kdt50R: kdT50 of tested population divided by KdT50 of Kisumu strain. KdT50: Kd time in minutes for 50% mosquitoes. KdT95: Kd time in minute for 95% mosquitoes. Mortality: mortality rate 24 hours post exposure to the insecticide. Our data indicate that frequent malaria transmission occurs in Douala city, a finding that is consistent with the majority of studies conducted in urban settings within sub-Saharan Africa [20–25]. The mosquito burden was primarily Culex, followed by A. gambiae, and Mansonia. The large number of Culex suggests that the area is experiencing difficulties with water and waste management of the type that is common to unplanned urbanized areas in Africa [26, 27]. The An. gambiae densities were far greater than what might have been expected, thus supporting the possibility of adaptation of this species to urban areas . Although the An. gambiae biting densities were subject to seasonal fluctuations, this species was present all year long owing to the presence of abundant collections of standing water in the district. However, An. gambiae samples consisted almost exclusively of the M form, a finding consistent with earlier studies conducted in Cameroon that indicated the high prevalence of this molecular form in coastal areas [29–31]. The predominance of the M form over the S form in the study area is most likely associated with its higher tolerance to salinity (Costantini, unpublished data). Human landing catches appeared to be far more efficient than CDC light traps. This observation is consistent with data from several studies comparing the efficacy of HLC with a diverse range of mosquito collection methods [32, 33]. Indeed during HLC, mosquitoes are attracted by both visual and chemical stimuli, whereas CDC light traps use only visual stimuli. However, the fact that HLC was undertaken outdoors while CDC LT was conducted indoors could have overestimated the efficiency of HLC compared with CDC LT. Because of the personal and property related security issues in Douala, household owners did not permit us to conduct indoor HLC; this prompted us to adjust the study design, whereby HLC was conducted exclusively outdoors while CDC LT continued to be placed indoors. The number of species collected fluctuated substantially between the two methods but was in agreement with previous studies that have indicated that the efficiency of a collection method can vary according to the composition of the mosquito species present, mosquito densities, availability of alternative hosts, and city lighting [33–35]. The sampling efficiency of both collection methods was found to be independent of vector abundance. Although comparisons between collection methods commonly use log transformation of direct counts, the method used here would have little bias because it uses log(x + 1) instead of log(x) . However, use of negative binomial regression analysis or Bayesian estimations might be more appropriate for some studies . Malaria transmission estimates in Ndogpassi district were relatively high compared to records from similar urban settings [27, 36, 37]. The data are consistent with parasitological and clinical records revealing a high prevalence of malarial disease in the population, however . Malaria transmission was detected only during the rainy season, despite the continuous presence of An. gambiae and could probably be associated to the low infectiousness of the human reservoir [8, 21, 36, 39] alternatively, it could reflect the influence of high temperature and low humidity on the longevity and vectorial capacity of An. gambiae during the dry season. Several factors can influence parasite prevalence in humans and mosquito infectivity; these include, for example, the use of protective measures against mosquitoes, health seeking behaviors, socio-economic status, and immunity [40–42]. Although malaria transmission estimates were not assessed across the city, an earlier study suggested that there might be a heterogeneous risk for malaria transmission that is dependent on the distribution of An. gambiae. The situation in Douala could be similar to that of Yaoundé where malaria transmission has been estimated at 277–365 infectious bites per human per year in the peripheral districts, and 3–33 infectious bites per human per year in the central districts [7, 8, 27]. According to Robert et al. , the annual inoculation rates in sub-Saharan Africa could be as high as 7.1 in the city centers, 45.8 in peri-urban areas and 167.7 in rural areas. The data from this study exceeded the anticipated estimates for central districts and could indicate that the high malaria prevalence is maintained by frequent migration of populations from highly endemic rural areas to the city. Moreover, the fact that no transmission was detected during certain periods of the year does not totally exclude the possibility of perennial malaria transmission since clinical cases were reported all year long in the local health care center (data not shown). Clearly, further studies for are needed to obtain better understanding of all the factors influencing malaria transmission in Douala. The level of An. gambiae susceptibility to DDT and pyrethroid insecticides, and the frequency of the kdr allele in the An. gambiae population were in agreement with previous studies [10, 43]. The high prevalence of insecticide resistance in the mosquito population of Ndogpassi district can be attributed to the frequent use of chemical insecticides for market gardening and personal protection . Apart from insecticide-treated bed nets, insecticide sprays and coils were reported to be in regular use in households , whereas up to eight different insecticide mixtures including pyrethroids, organochlorines, organophosphorus and carbamates have also been reported to be in regular use for urban farming in Cameroon . A direct association between urban farming and increased insecticide resistance in malaria vectors has been reported in several studies [23, 25, 45, 46]. Despite the high prevalence of the kdr allele in mosquito populations, and its close association with resistance to both permethrin and DDT , this resistance mechanism might not be fully responsible for all of the insecticide resistance phenotypes that exist. Further studies are underway to explore the importance of metabolic resistance to insecticides in mosquito populations. The rapid expansion of insecticide resistance is becoming a serious challenge for malaria control across Africa that calls for sustainable solutions [47, 48]. The present study reveals high densities of An. 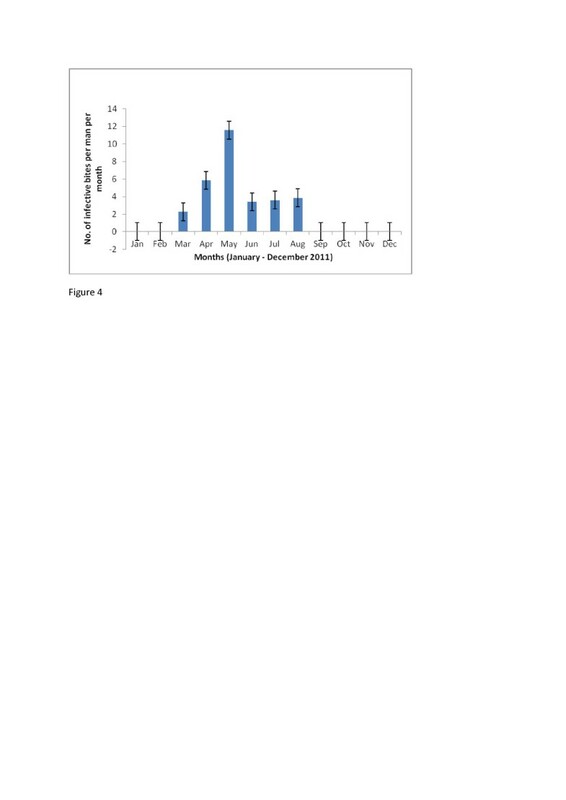 gambiae associated with seasonal malaria transmission in the district of Ndogpassi, Douala, Cameroon. Moreover, our surveys showed a high prevalence of An. gambiae that are resistant to both DDT and permethrin. These data might be of great importance to assess the dynamic of malaria transmission and insecticide resistance in Douala after the recent nationwide free distribution of long lasting insecticidal nets to the population. We will like to thank Kopya Edmond and Benjamin Menze who helped will field and laboratory analysis. We also like to thank the people of Ndogpassi district in Douala for their cooperation throughout the study. CAN, PAA conceived of and designed the study protocol. BDT, RTF, PK, BTF, CN, PAA, and CAN participated in the field sample collections. BDT, BTF, CN, and CAN carried out the molecular and ELISA analyses; LGL, TT, and PK helped to draft and revise the manuscript. CAN was responsible for data analysis and interpretation and also wrote the paper. All authors have read and approved the final version.